CODY, Wyo. – Aspen trees are on the rebound in and around Yellowstone National Park, and a new report says predators deserve the credit. Luke Painter, a wildlife ecologist at Oregon State University and the study’s lead author, says the trees were in decline for decades largely because concentrated elk populations were eating new tree shoots. He says since wolves were reintroduced, elk numbers have decreased and most of the herd’s winter range is now outside the park. Wolves, along with bears, cougars and hunters outside the park, are culling the elk herd, which translates into fewer elk grazing on aspen and other woody species. Putting wolves back into the park in 1995 was a point of controversy because of ranchers’ concerns about losing livestock and dogs, and outfitters who worried that fewer elk could mean a loss of tourism dollars. Painter admits that some outfitters that depended on large elk concentrations in and near the park in the 1980s and ’90s have lost some of that business. Painter says what’s happening in Yellowstone is the emergence of an ecosystem that is more normal for the region and one that will support greater biodiversity. 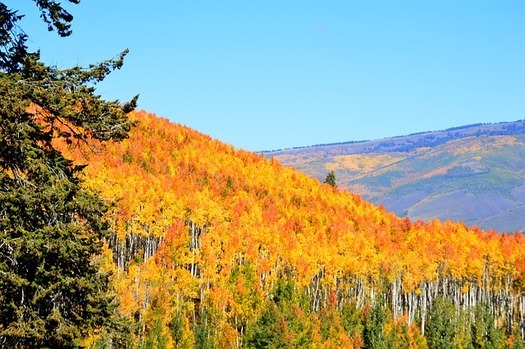 He says as one of the area’s few deciduous trees, aspens are important because birds, insects and various kinds of plants thrive in their stands. Painter notes that restoring aspen in northern Yellowstone has been a goal of the National Park Service for decades, a goal he says it largely has reached by letting the animals do the heavy lifting.